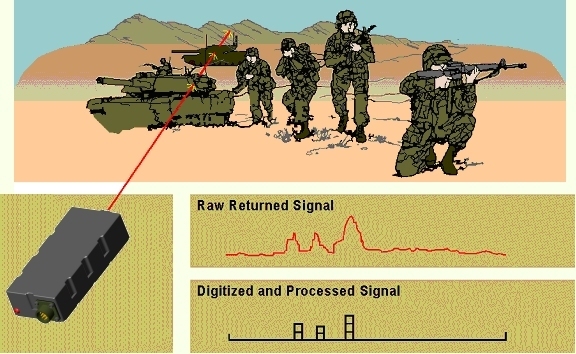 Laserdyne’s unique rangefinding techniques extract more useful data from a single ranging pulse than any other method on the market today. These systems employ advanced digital signal processing technology to provide accurate, reliable ranging with true multiple-target detection capability. This key technology was developed by Laserdyne for rangefinder and mapping applications. All received signals are recorded for the entire round-trip time of the laser pulse corresponding to the maximum rated ranging performance of the product. For example, a model rated to 10km records a round-trip time of 20km. These signals are digitised, stored and “combed” with a filter to determine potential real target returns which are then processed to accurately determine their ranges. Return to RangePRO Laser Range Finder home.